I’m feeling uneasy; slightly sick. It’s been nearly a week since I wrote a list. This holiday malarkey is really starting to rub off on me. 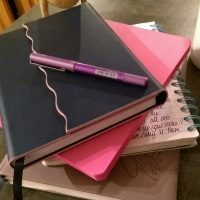 Actually, that’s not true – not the holiday bit as I would go as far to say I’m almost relaxed – but I’ve started another notebook with a different style of list…a ‘gratitude journal’ is the posh name apparently. Going to bed each night as if I’ve been to battle – fighting laundry, washing-up, children, life- I thought it might be an idea to write down any moments that had been better than awful that day. It turns out that 1) a day can sometimes feel like 3 days in 1 and 2) some days you can catch some rather precious moments. Admittedly, I’ve only made a week’s worth of entries into my lovely new faux-leather, pink-rimmed, magnetic closing, navy notebook but it has definitely lifted my spirits before falling into a peaceful slumber (for about an hour before the first visitor of the night crawls into the bed and wriggles all night long). I think my favourite entry so far was No.3 trying to crack an egg and catch the yolk for his meringues. The first egg just crumbled, shell and all, into the bowl. The 2nd attempt didn’t even make it into the bowl and smacked onto the floor as only eggs can. But because we were ‘having a moment’ – all baking their favourite treats – we all burst out laughing (and I didn’t overreact like my usual screaming banshee when all I can think is “more blinking clearing up”!). No.1 suggested we should have recorded it on slow-mo and I wished these rare perfect (totally imperfect/in-it-together) family moments would be etched in my mind in slow-mo. So, I would heartily recommend jotting down in old-school notepads with an old-school biro/pencil/crayon (whatever you can find) the lovely moments of the day and remember to leave out the “He shoved me first” / “Who’s wee’d all over floor again?” / “Why can’t you just pick up your socks?” / “We’re late, put your socks on – where are they?” / “Why is there play-doh on the lounge carpet?” / “I just want to sit down for 5 minutes without a disaster”…kind of moments and thoughts because you can have those any time you have children near you.